Milestone T shirts are all very well, but there’s a heck of a gap between the black 100 shirt and the green 250 one. 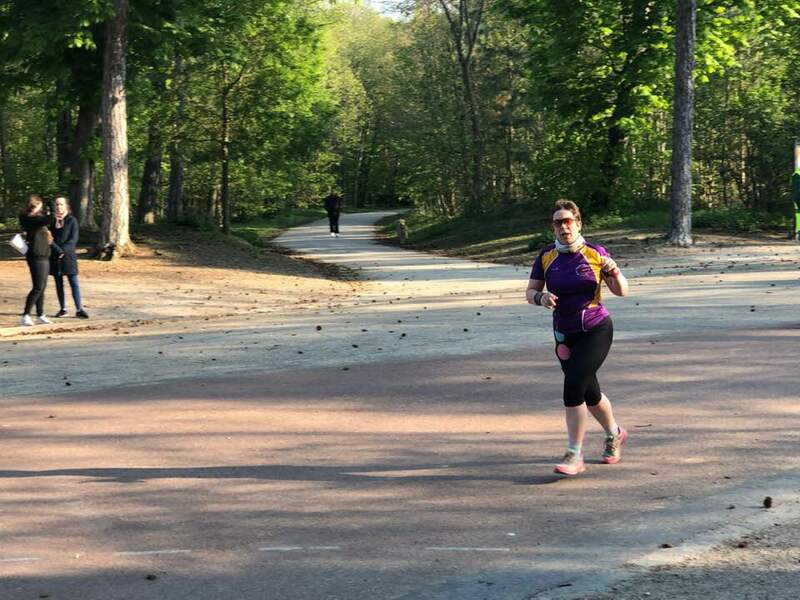 Running at 50 parkruns each year is a big committment – I’m a pretty regular attender and even I only managed 40 in 2017. So you’re looking at at least 3 years between 100 and 250. So I decided to have a bit of fun with my 200th parkrun. Firstly, I ensured that it coincided with my 100 time at Wallace, proving just what a serial tourist I am, as well as being a bit fanatic about mathematical symmetry and patterns. This was not without a few sleepless nights in January, hoping that cancellations due to ice wouldn’t sotally scupper my plans. I needed a shirt, so I got a strip of wide black ribbon, and used my trusty fabric paint to write a number 2 (stop sniggering at the back). Someone aksed if it was done with toothpaste – believe me, if I thought that would be funnier I would do it! I attached it over the 1 on my 100 shirt with safety pins. For the cake, I know that fruit based offerings are usually popular, so I got a friend to bake me a large rectangular sponge, and I decorated it with cream and spelled out the 200 in raspberries, and the 100 in blueberries, with black and green grapes for the border. It looked well, but smaller raspberries would have been easier to work with, and it was a bit awkward to transport. You know me, any excuse to dress up! So I needed a suitable theme. I went with the “Wallace as Braveheart” idea, and as I have plenty of tartan bits and bobs around, all I needed for this look was some blue face paint. Shouting “Freedom” as I went round each corner was an easy way to keep in character, an bring a smile to many faces. John, the RD gave me a great speech, and pointed out that in getting to 200 runs, I’d also volunteered 33 times, taking on almost every role….except one. And would I like to be guest RD some day soon. It was a bitterly cold day, so I really appreciated the support from friends and family who came along- to cousin David who ran with me on his first toruism venture, and his wife Karen who helped with the teas and cake. To Liz and Emma, the Murphy twins, who ran at Wallace even though they have nightmares about “Heartbreak Hill”, and for the card and the afternoon tea afterwards. To Susan, who wore her old Wallace school tie. And to my husband who helped trasnport the cake, and who was my usual faithful paprazzo. At the end someone pointed out that was 1,000km. Here’s to the next 1,000! Congratulations on your great achievement. So glad you had some family support. Loved the ” Wallace theme,” and the cake looked terrific.